I love spinach any which way however I especially like it when presented as a tasty salad. 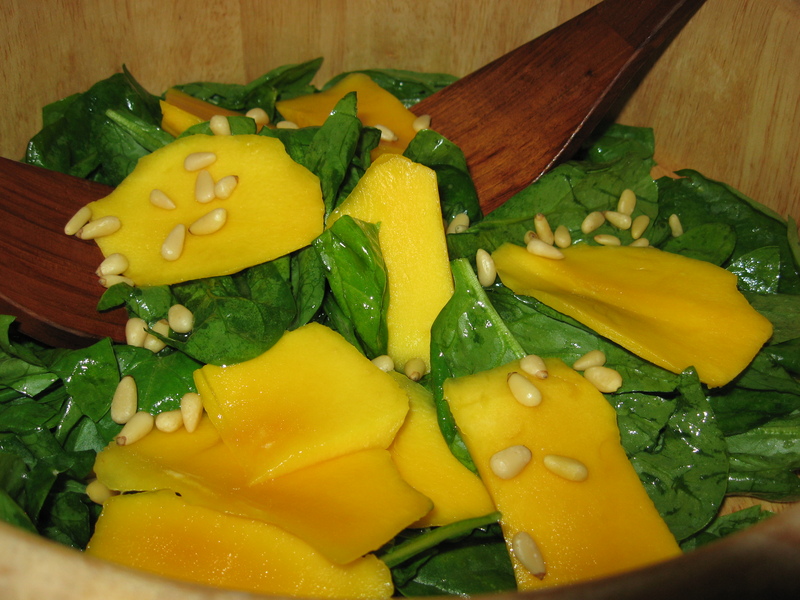 When the fresh mangos are out in their best form, that’s when I usually think of my combo spinach mango delight. Topping it with this Asian sesame ginger dressing makes this salad just about perfect—or at least I think so. Here’s the recipe to share and hope you enjoy it as much as I do. Place dressing ingredients in a lidded jar and shake well. Put in frig..
2. Wash the spinach in the spinner and store spinner/spinach in the frig. 3. Peel and slice mangos. Place on a dish and cover with saran rap. Store in frig. 4. Keep salad bowl, serving implements out on counter top with pine nuts near by. So now, that you have your salad all ready to go, you can also start organizing the rest of your meal. I am always doing dishes as I go so that when my guests arrive, the kitchen is relatively neat and clean. I always make sure that my dishwasher is EMPTY. That makes cleanup after the guests leave a breeze. Because I am such a neat-nick, I guess that I would not do well in a busy restaurant kitchen—however, having been an innkeeper for 5 years, this method worked very well for me. So, just a couple of hints from the TempInnKeeper Margot. Hope they can work for you as well.